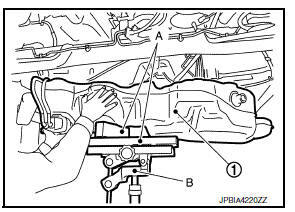 Be sure to read вЂњGeneral PrecautionsвЂќ when working on the fuel system. Refer to FL-2, "General Precaution". 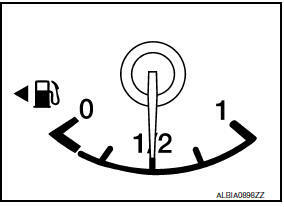 (6-5/8 US gal, 5-1/2 Imp gal) of fuel is drained from a full fuel tank. Disconnect park brake rear cables and position the rear park brake cables aside. Refer to PB-7, "Exploded View". Remove the tunnel stay, front exhaust tube and sub muffler. Refer to EX-5, "Removal and Installation". 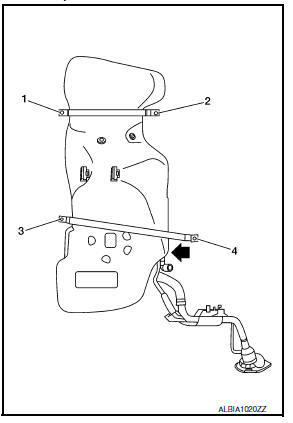 Disconnect harness connector (1), fuel feed hose (3), and quick connector (4) from fuel level sensor unit, fuel filter and fuel pump assembly (2). Do not use any tools to disconnected quick connector. Remove the tunnel stay and center exhaust tube, without muffler. Refer to EX-5, "Exploded View". Remove the fuel tank protector. Disconnect the rear cables and position the rear cables aside. 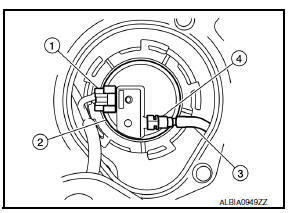 Refer to BR-42, "Exploded View" (Drum brake) or PB-9, "Exploded View - Disc Brake" (Disc brake). 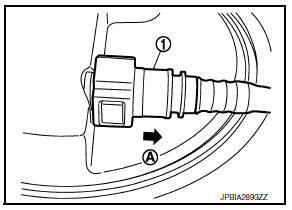 Disconnect return line from filler hose. Disconnect vent hose from fuel tank. 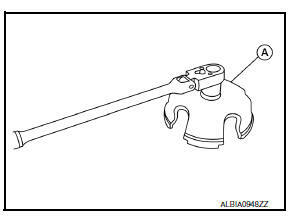 Support the center of the fuel tank (1) with a suitable jack (B) and secure the fuel tank to the jack. Securely support the fuel tank with a piece of wood (A). Fuel tank may be in an unstable condition, due to the shape of the fuel tank bottom. Be sure to secure tank at all times. Remove fuel tank mounting bands (RH/LH). 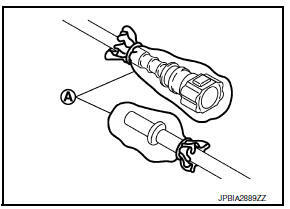 Lower suitable jack carefully to remove fuel tank while holding it by hand. 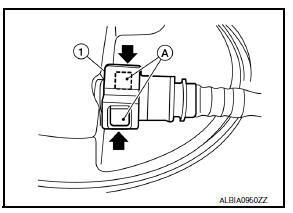 Remove lock ring for fuel level sensor unit, fuel filter and fuel pump assembly with Tool (A) by turning counterclockwise (if necessary). 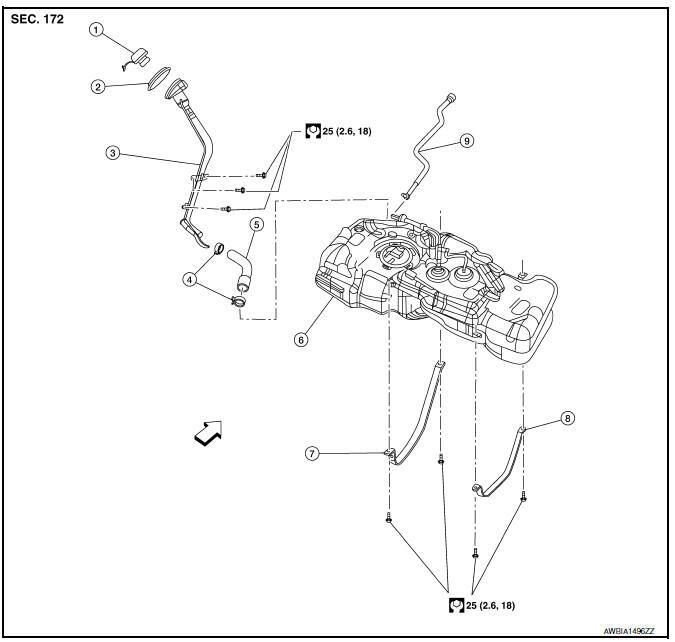 Remove fuel level sensor unit, fuel filter and fuel pump assembly (if necessary). Do not pollute the inside by residue fuel. Draw out avoiding inclination by supporting with a cloth. Do not use any lubrication to aid with the installation of tubes and hoses. Before tightening the fuel tank mounting bands, install the filler hose to the length of 35 mm (1.38 in), all other hoses to 25 mm (0.98 in). Tighten the clamps until the head of the bolt is on the paint mark on the clamp band. Tight mounting band bolts 1 and 2 to specification. Hand tighten mounting band bolt 3. While pushing the tank in the direction shown, tighten mounting band bolt 4 to specification then mounting band bolt 3.